Please read through the class descriptions below. If you still would like assistance picking the appropriate class(es), let us know! Every Body's Yoga suitable and beneficial for all levels and every body. All classes are "drop-in" (unless noted) which means you never need to pre-register. Just pick the class you'd like to attend and show up! We also have mats to borrow at no additional cost. Please feel free to enjoy a cup of organic tea after class! ​SOMA YOGA or Somatics, is a series of gentle, safe movements, which teach you to relax habitually contracted muscles that have simply "forgotten" how to relax. These are the muscles which, when held unconsciously, contribute to a host of painful conditions such as: chronic back pain, neck, shoulder, hip and joint pain, inflexibility, postural imbalances, headaches, knee and foot pain, and sciatica. YOGA FOR FERTILITY & WOMEN'S HEALTH The health benefits of yoga for fertility include all the general benefits of traditional yoga for women plus more. What differentiates our class is which poses and practices we choose to do and not to do! In yoga for fertility, we choose to focus on the poses and practices that specifically help us prepare for ovulation, conception and pregnancy. Registration required. See Updates page for details. GENTLE YOGA Gentle Yoga is designed to allow almost anyone to participate in a very gentle form of Yoga. The result is increased flexibility, strength, balance, and circulation. Gentle Yoga encourages proper breathing and better posture. There are no Inversions or Vinyasa flow in this class! Take this class to relieve stiffness and pain, rejuvenate the muscles, and lubricate the joints. HAPPY HOUR 2 for 1 - Bring a friend for free! Win EBY Shirts, free classes etc. Enjoy the lighter side of yoga while you let go of your work week and transition into your weekend. Go with the flow and enjoy this vigorous practice with upbeat music. Organic snacks and refreshments after class. MEDITATION hosted by Open Heart Mindfulness Community. More information on the Updates page. RESTORATIVE YOGA Our regular Yoga classes are full of energy and movement; to counter this we offer Restorative Yoga classes. These classes slow way down as we begin to explore more healing and restful, restorative postures. We use lots of props and the positions are held for longer periods of time as we let gravity do the work. This class is held the third Sunday of each month. AYURYOGA You will experience the blending of Ayurveda and Yoga. Together they bring peace and healing to your life by restoring a pranic flow. Ayurveda teaches the art of living in harmony with nature by utilizing food, lifestyle, and herbal protocols based upon an individual's constitution. Yoga offers pranayama, asana, meditation, mudra, and ethical lifestyle practices to support the mind, body and spirit. YIN YOGA (Traditional Yin Yoga) Yin is In! Yin Yoga has been with us since the beginning of Hatha Yoga centuries ago. But since the early 19th century, Yoga has become more and more yang-like in nature. Everything requires balance: yin completes yang. Yin Yoga is the balancing practice for the more active, muscular yang Yoga classes. Most forms of Yoga today are dynamic, active practices designed to work only half of our body, the muscular half, the "yang" tissues. Yin Yoga allows us to work the other half, the deeper "yin" tissues of our ligaments, joints, deep fascial networks, and even our bones. All of our tissues are important and need to be exercised so that we can achieve optimal health and vitality. Yin Yoga is not Restorative yoga. Yin Yoga is simple, but simple does not mean easy. We can remain in the postures anywhere from one to five minutes! Yin Yoga is a part of the original Hatha yoga tradition. In its modern incarnation, Yin Yoga combines the influences of Indian yoga with Chinese Daoist practices and western science to improve our health on many levels with its emphasis on long-held, passive stresses of the deeper connective tissues. The body and mind relax into stillness and are deeply nourished by the balance of yang & yin! ​This class is for everyone from beginner to experienced *but we do not recommend this class if you have hip or knee replacements or spinal injuries. YOGA EBY's Yoga classes are tailored to the needs and desires of our students. All classes are challenging and informative for all levels (which means we do not have to put limiting levels on them). Due to the high level of training and skills of our teachers, we are able to make adjustments during the classes, which keep all students, regardless of personal skill level, challenged. We use vinyasa flow in our regular yoga classes, incorporating several traditions of practice into a fluid, breath-linked asana sequence. It is the most common style of practice in the west...but at EBYoga, safe alignment and breath are still a priority. ASTANGA YOGA is a system of Yoga transmitted to the modern world by Sri K. Pattabhi Jois (1915-2009). Astanga means eight limbs or branches, of which asana (physical postures) is merely one of the eight branches. Pattabhi Jois put a strong emphasis on practicing Astanga Yoga - all eight Limbs! This method of Yoga involves synchronizing the breath, bandhas and drishti with a progressive series of postures - designed to heat up the body naturally, producing intense internal heat. The result is improved circulation, a light and strong body, and a calm mind! There are six series in the Astanga tradition, but we will be practicing variations within the Primary and Second Series. CORE YOGA classes are similar to our regular Yoga classes with a bit more emphasis on strengthening the core. We do this by selecting postures that target the back stabilizing muscles to strengthen, tone and bring more flexibility and ease into your body! FYI - The rectus abdominis is only one of the nine back stabilizing muscles! YOGA SCULPT This class is a Yoga flow using light weights, a core ball, and various resistance bands to target our core muscles. It is designed to tone and sculpt, relieve pain, enhance performance and improve posture. A true total body workout! 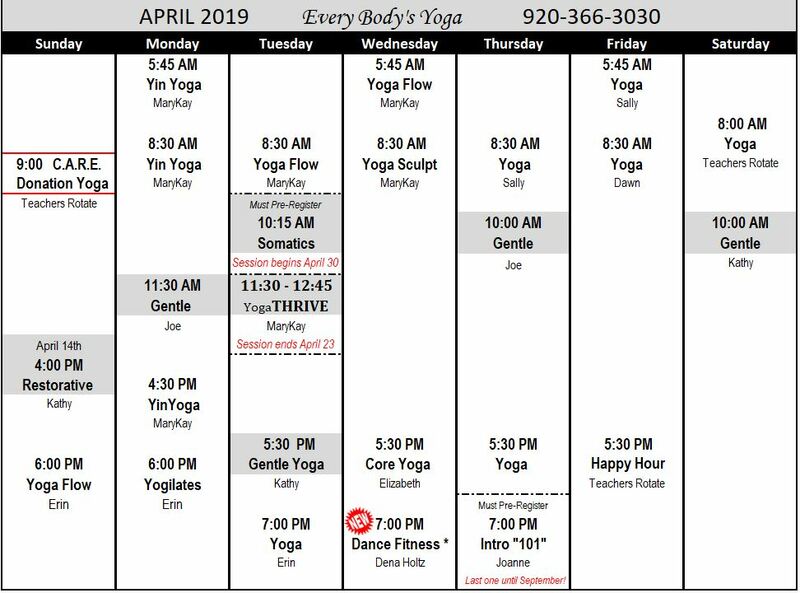 This class can be modified for all fitness levels, and it's essence is based in Yoga – the true workout comes from listening to your body and taking care of yourself. A great complement to your other activities. By switching up your Yoga classes and workouts, you will avoid a plateau and never get bored!